Don't tune out yet - this is actually pretty important stuff! Really, with diagnostic foreground questions we are asking: does a particular piece of subjective or objective data (i.e. test, physical exam finding, imaging) have value in ruling IN or ruling OUT a condition? And if so, HOW valuable is it? Pre-test probability: what is the probability that my patient has disease x prior to any workup? 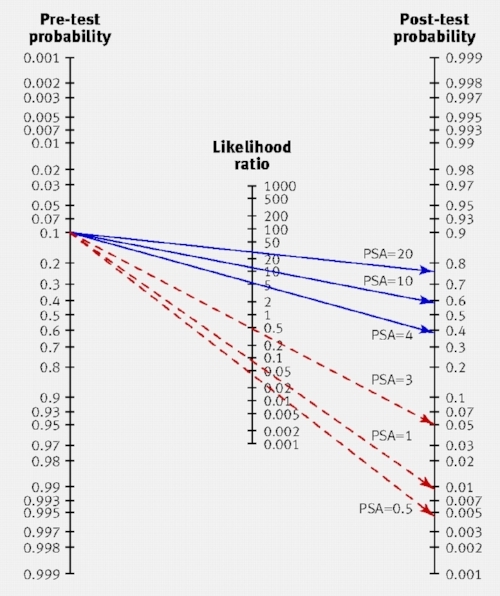 Post-test probability: what is the probability that my patient has disease x after my workup? Check out the helpful graphic to the left. Sometimes we need to move to the literature to ask HOW useful is a given test is. There really isn’t any ONE study design used for diagnostic tests. They are often observational, but sometimes are studied with RCTs or systematic reviews as well. Partial verification bias - when a study of a diagnostic test doesn’t expose all patients to the reference or gold standard test. Some people may be more likely to send a positive stress test for left heart catheterization, but may not send a negative stress test for LHC. This may lead to overestimation of the utility of stress testing for coronary artery disease. Will this change my management? Was the population used to study a given diagnostic test generalizable to my patient population? Will the patient be better off as a result of the test?